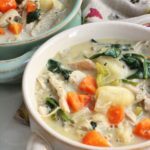 Chicken Gnocchi Soup: Paleo & Easy! + Recipe Video! Nothing says, “I love you” like creamy chicken gnocchi soup, right? Right. Especially when you’re making this healthier, veggie packed version for your significant other. 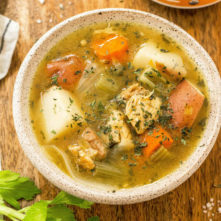 This chicken gnocchi soup is comparable to Olive Garden’s menu offering, but without the ingredients that are going to cause you to feel less than your best the day after. Made in less than 30 minutes, staying home with your S/O just makes sense! 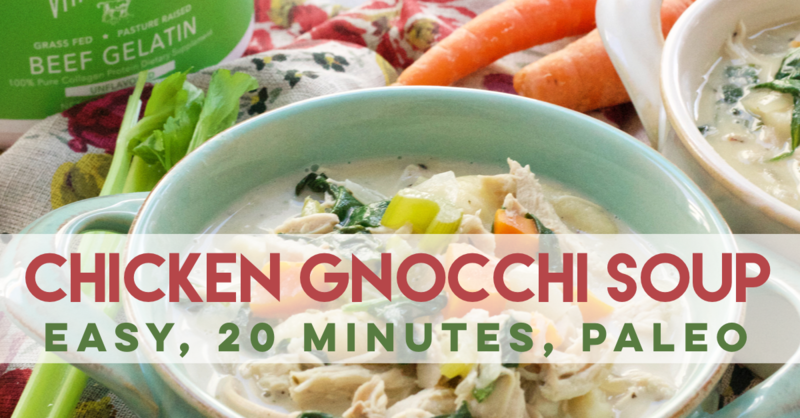 When you’re planning your Valentine’s menu and writing your grocery list, make it easier on yourself by picking up a few pre-made ingredients for this chicken gnocchi soup. More time enjoying your night > time in the kitchen. 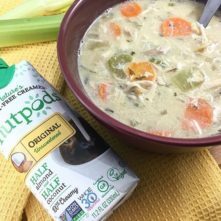 Grab a rotisserie chicken and Paleo potato gnocchi from the freezer section and this soup comes together in no time. It’s a super quick and easy addition to your main course! 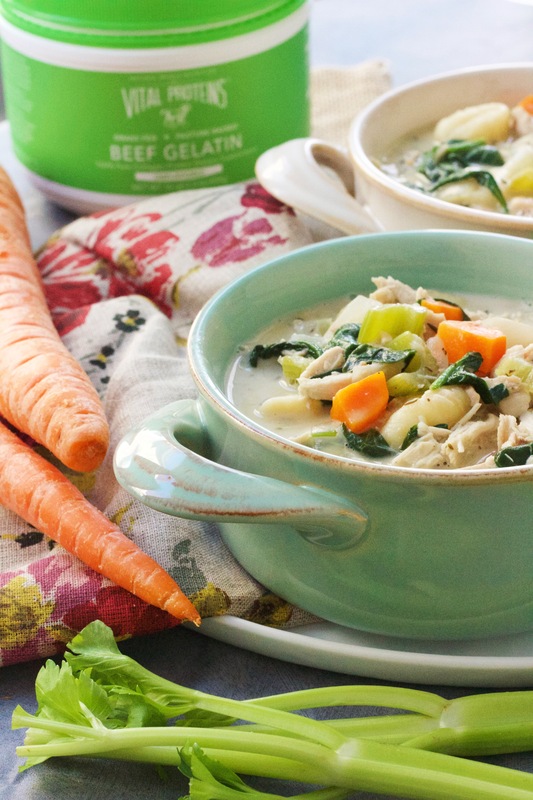 This chicken gnocchi soup gets it’s thick and creamy texture from beef gelatin. It makes a HUGE difference when you’re thickening the liquid you’ll add in. Seriously. I’m convinced that it’s the gelatin that makes this soup recipe restaurant quality. Fun fact: many restaurant chefs swear by using beef gelatin as their secret to perfect pan sauces and glazes, thick soups, and the juicy texture in meatballs. I used to totally be an arrowroot flour and tapioca starch kinda girl when I needed a thickener. Mostly because I didn’t quite understand what gelatin was used for besides, well, jello. I’ve now completely converted and I’m telling you, gelatin is way easier to work with than the cornstarch replacements. It doesn’t make your sauce or soup clumpy, and it freezes really well. 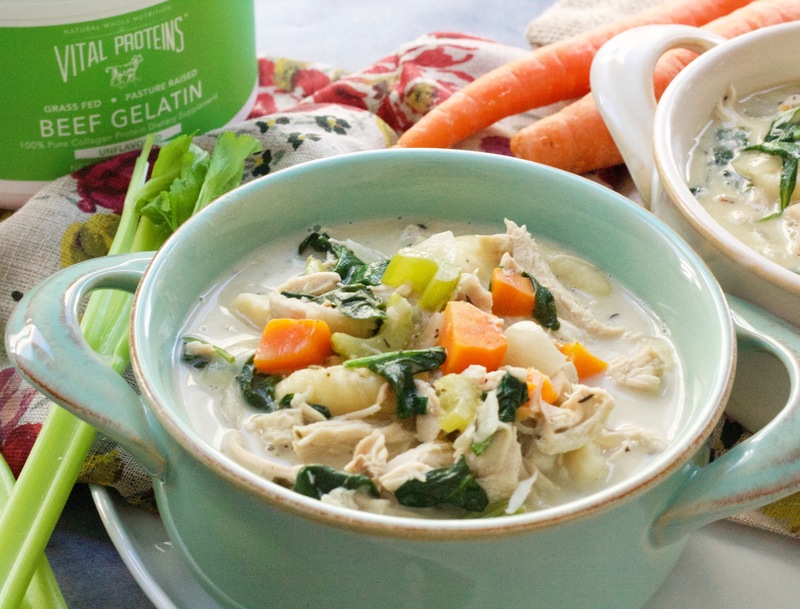 Using gelatin in this chicken gnocchi soup makes it thick and creamy without the clumps like you sometimes get from arrowroot flour. Beyond the functionality of it, beef gelatin from Vital Proteins has way more health benefits than just being a starch. Beef gelatin is a form of collagen, but the main difference is that it gels as it cools. It has all the same benefits of collagen peptides (hair growth, healthy skin, better muscle recovery and increased joint mobility), 19 grams of protein per serving, and it’s one of the most easily digestible sources of protein. It’s flavorless, which made it a really easy addition to my routine. One and a half teaspoons of beef gelatin per cup of liquid is all you need for a smooth, emulsified pan sauce. If a recipe says “bloom” gelatin, that means mix it in a small amount of liquid, usually water or broth. This is generally always done prior to being added to a recipe because it activates the gelling properites. High acidity foods (fruits like pineapple) contain enzymes that destroy protein, which causes the gelatin not to gel properly (because it’s a protein!). If you’re using to make jello, desserts or gummies, just boil the fruit for 5 minutes first, as that inactivates those enzymes in fruit/fruit juices. Cool temperatures will make the gelatin stronger, so your gravy will thicken when removed from heat and the temperature starts to drop from boiling point. If you’re worried it’s not thickening while it’s over the stove, you don’t have to add more gelatin! If your recipe sits out for a while, or you refrigerate leftovers or meal prepped meals, you can simply reheat to liquify again! Get my favorite beef gelatin HERE! This looks so good!! Pinning it for later! Cannot wait to make this later! 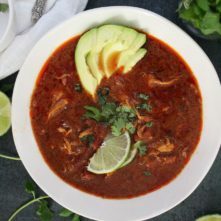 Its seriously saving me today with how quick and easy of a recipe it is! Yes! I hope you love it!! Thanks, girl! This is SO good! Can the beef gelatin be used in your other recipes in place of other thickeners? Thank you so much for all your work and recipes! If I don’t have beef gelatin what can I use? Collagen peptides? Unflavored gelatin? I have all the ingredients but that and really want to make this on my only day off tomorrow! Thanks Bailey! BTW loving the new layout! I’ve been taking a break from social media and have been pretty AWOL from the Internet in general, so I totally missed the announcement on Instagram. But when I stumbled upon this while trying to figure out how to make this paleo on my own, I was so excited to see it was from you! So I made this again today, since it was such a big hit… But I was in a hurry and forgot the gelatin. Still delicious. Awesome!! That’s good to know! Thank you so much!! Is this considered Whole30 compliant? Have you tried making this with cauliflower gnocchi (such as Trader Joe’s)? If you are going to use a different thickening agent such as arrowroot flour – how much do you suggest to use? This is the first time I’ve realized this DIDNT say cauliflower gnocchi… I use the Trader Joe’s cauliflower gnocchi every time. I follow the recipe exactly. No complaints. I’ve served it to others and they ask for the recipe!